Updated: 29th September – source code now released! Christian Corti the developer of Flod, the most accurate SoundTracker replay library for AS3 is back. This time with FlodXM. 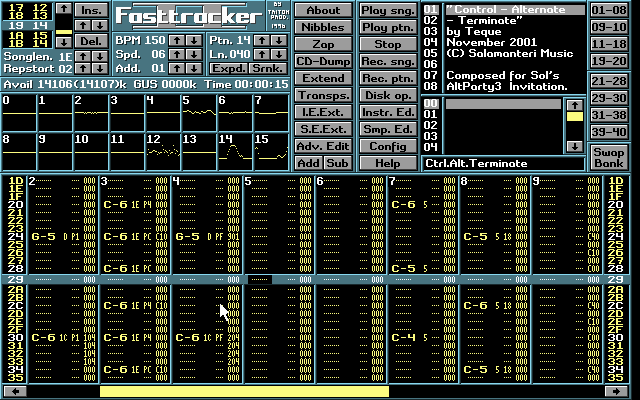 As the title implies this is a FastTracker 2 (XM format) player written in pure AS3. Fast Tracker and later FT2 was created by legendary demosceners Mr. H and Vogue of Triton (now Starbreeze Studios). XM format music was popular in the 90s and used in many commercial games including Unreal and Deus Ex, as well as widely in the demoscene. FlodXm brings this power to AS3, and while it’s nothing short of incredible we want to make it even better! We really need your help to test it. Please throw as many XM files at it as you can – the more esoteric and obscure the better! Christian really wants to support all of the various effects FastTracker has, including those created as a result of bugs in the original tracker code. So the more files we playback the better. FlodXM is embedded below after the jump, along with a File Upload form.